Last week, I was lucky enough to participate in a brainstorming meeting at a foundation that was developing a strategy for its digital platforms (web, social, mobile, etc). The process was facilitated byPeter Maher, founder and CEO, of Luma Institute. We used some Human Centered Design techniques from their “Innovating for People” design methods recipe book. It was the most stimulating web platform strategy session that I have ever experienced! What is Human Centered Design? Is it only used by people with artistic talents and graphic design skills? Anyone can be a designer! These are methods for developing solutions (any type) in service of people. By applying to this approach to web development or any program development or strategy, your nonprofit can more innovative and impactful results. When I worked with a web developer for my blog redesign and hearing about how nonprofits typically approach platform design, there isn’t this much depth and creativity. Many times it is focused on “getting it done efficiently” and features. A quick focus on the solutions without taking the time to understand the challenges and open up creative thinking. As a result platform development strategy does not result in innovative thinking — and too much cookie cutter and template thinking. I really enjoyed how Peter Maher, CEO and Co-Founder of Luma-Institute facilitated the session. Not only was he a virtuoso facilitator but he was able to deftly move in and out of teacher mode and explain his tradecraft. I love being exposed to new ways of working, taking process notes, observing techniques, and thinking about how to apply to my own work. The all-day session had us brainstorm new ideas, prioritize, and flesh out some concepts. Here’s a high level overview of some of the methods the small group of 12 participants used. We had to understand the problem and the challenge we were working on. We were asked to listen to a PPT presentation that shared the history, mission, goals, challenges and opportunities. But, there was a twist – we were asked to do critical or active listening. Not just sit back and listen, but actively for three things: Roses or strengths, Thorns or problems, or Buds or opportunities. We were asked to write these down on sticky notes (Pink for Roses; Blue for Thorns; and Green for Buds). The purpose was for us to visualize the current situation individually. Brainstorming is about problem-solving and before you can start to add the creativity, you need to be a creative problem solver. Since we were asked to listen critically, it was very engaging. It also put us into a different mindset. Next we went through the process of putting our sticky notes on the wall together. We generated at least several hundred sticky notes. The process felt organic, but with Peter’s skillful facilitation we did a rapid “Affinity Mapping,” organizing the sticky notes into logical categories and groups. It was amazing to see the themes appear and to visually see the strengths, challenges, and opportunities. It also helped us a group see the problem together – an important base for innovative thinking. We did a round of collective sense-making to see the big patterns and themes – drawing insights from by defining common themes and attributes and identifying the tension points. Next, we drilled into each theme to clarify why we grouped particular items into particular categories and where they might be some sub-categories. Peter facilitated conversation that helped us build a shared understanding of the current situation. He also stepped into teacher mode and explained some of the tradecraft of facilitating this particular method. We synthesized the issues by generating a list of questions that could be used as a brainstorming questions. We worked in small groups for the next process which helped us focus the problem a bit more. The creative matrix can help narrow down a problem that is too broad and help you break away from conventional thinking. It can also help generate many ideas. Each small group was asked to pick and revise four questions or problem statements and the rows were categories for enabling solutions – program, communications, technology, etc. We were asked to brainstorm as many ideas for each cell on sticky notes in the space of 15 minutes. Our group generated 100 ideas! This process helped us prioritized some of the best ideas. We used a simple 2×2 matrix where we ranked the best ideas on importance (low to high) and difficulty (low to high). Difficulty could be time, cultural, or cost. While it isn’t a scientific cost/benefit study, it helps resolves differing opinions, prioritize ideas quickly, and leads easily to a plan of action. We were given a choice to use a particular “Making” method for envisioning and fleshing out the idea/concept that emerged. We selected “Concept Poster,” a presentation format illustrating the points of a new idea. We were encouraged not to over think it. The first sheet was a headline and drawing along with some bullet points that identified key features and benefits. The second sheet was an implementation timeline. We then presented our concept to the group. After each group presented, everyone was given 5 green sticky tabs and one red tab. We were asked to place the green sticky tabs on a detail that we liked. The red tab was placed on the overall concept we liked best. We immediately were able to rank and rate each presentation – and have a productive group discussion on the ideas. Using structured brainstorming methods can lead to innovative ideas for nonprofit programs, platforms, and strategies in any area. However, to some it might seem like “extra” or “wasted” time because it isn’t the “to do list.” Investing the time to brainstorm, think creatively, analyze, and flesh out concepts and other human centered design principles can lead nonprofits to better results. Has your nonprofits human centered design to develop ideas or strategy for its digital platforms, communications strategy, or program development? What was your experience? 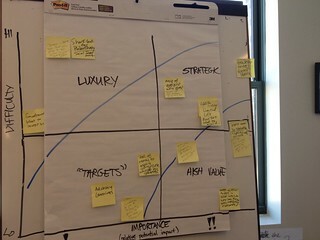 I’ve participated in several brainstorming sessions where we put ideas on sticky notes and collaboratively grouped them in order figure out where there we natural areas to focus, but I haven’t seen either (1) a similar process used to focus on listening and digging down into the problem first; or (2) color coding strengths, challenges and opportunities. I really like how the resulting affinity map gives you a quick sense of what each area means so that the organization can appropriately balance efforts to leverage strengths and address weaknesses. Thanks for this recap. Great to see something that is not just a remix of the usual appeoaches. I eapecially like the Affinity Map and could see adapting this with consulting clients to help them get past problem solving mode and develop more confidence in their own capacity to address their challenges more independently. Hey…This is amazing. How simple real life concepts are used to design a new strategy…very interesting and natural. I liked the concept of affinity mapping.This is so logical and gives a very clear picture thereby aiding in the decision making process. Thanks for sharing it Beth. I’ve been facilitating design thinking workshops for a few years now, I really appreciate the perspective presented in this post. I have much to think about. I have sat in many post- it sessions too-so good to see the initial session evolve into a cohesive, mutually agreed path forward. I love the mining of each individual’s creativity too. Again thanks for your generosity! What struck you? What resonated? What specific methods are you using? How does this approach differ or is similar? I have been using similar methods, but not in this specific way — we have to talk tradecraft some point. Maybe I’ll get a chance to get to Hawaii at some point. I like the active listening piece a lot because I think it is something a lot of folks could put into practice easily. A lot of us do slide presentations and this sounds like an easy modification to the usual “I’ll present and you listen”. By setting up your audience before you begin to listen for three things, like the Rose/Thorn/Bud, as you said Beth it puts the audience into a much more active listening role. I think it’s something many folks could easily incorporate. Jono – thanks for sharing. So cool to hear about HCD techniques at work in a foundation setting. Such a great “leveler” and way get everyone engaged and focused. I am a User Experience consultant and love working with non-profits, going through the same brainstorming and strategy exercises as I would for any corporate client. The two worlds have so much to learn from one another! A possible next step from the “concept & synthesis” would be some paper prototyping and user feedback. Great write up – thank you. Neil – you are so correct. Too many folks (myself sometimes too) rush to the tips, solutions, and actions before strategic thinking and analysis. Such a fantastic post, Beth! This is an issue that I’ve been interested in in relations to digital storytelling for the last few years. Great article and process. We have devised a web platform to enable these types of strategic and design thinking sessions online, we also use the platform ipad application onsite to quickly capture the results of these sessions in-person and continue the conversation online after the event. Vanessa, thanks for that resource! I like it! Organization is a fundamental key. Waste time? Not so. This is amethod that can save time and be much more precise. Details allow for wonderful understanding and allows for more productivity. I love it! Thank you for sharing in so much less time than it must of took you to work through the method to receive understanding. You have shared valuable information and in a time saving way.Thank you again. I feel like I hit a jackpot of wealth. This is such a thorough and understandable relating of the session–it makes me feel like I was really there! There’s a lot I’m thinking about, but something that was almost offhand in your description really struck me: including cultural analysis in the assessment of the ‘cost’ of a given approach or change. I think a lot about how organizational culture, as one iteration, can be a force for or in resistance to change, and I appreciate when that consideration is explicitly included. Thank you for sharing! Great post, Beth. The LUMA institute has done a fantastic job of making human-centered design more accessible to organizations. Neil brought up a good point about process. Lots of practitioners actually have different variations of the design process for making sense of the problems and opportunities. Deeper “problem exploration” becomes crucial since many of the issues social organizations face are broad, complex, and constantly in flux. It’s not uncommon to see the needs of clients dramatically shift elsewhere in just one year. So, some other methods to fill in the gap include contextual interviews, cultural probes, et al. Yes, some organizational leaders might find all of this a waste of time. They’re not. If facilitated well, these sessions can be effective in combining the “thinking power” of all parties involved especially if the organization has experienced some kind of bottleneck. It’s also not a waste of time if they want to continually track the ever-changing landscape and tap into unmet needs. Bryann: Thanks for sharing your experience. Have you used these techniques? What has been your experience? Also, for anyone still listening through this comment thread .. anyone have recommendations for places to take workshops on these techniques? I keep getting asked this question and I have some suggestions but would love more. Beth you are a gift! Thank you so much for taking the time to not only share the blog of this experience, but synthesizing it into a slide deck! I’ve used a lot of these techniques separately, very interesting to hear about the experience of weaving them all together so skillfully. We should definitely have coffee and talk facilitation techniques. I’ve been incorporating a lot of these into my training and facilitation work. I’m also taking Luma Institute’s workshop next year – because they also share an overall design process of how to weave these together. I really liked how they designed the whole agenda and the arc of the day. It was an amazing experience. I aspire to do that in my work! They are offering a workshop in March here in SF and I’m definitely going. Thanks again and cheers to all for a Happy New Year 2014!